"A very flavorful Asian-type meal with a sweet heat that incorporates my favorite flavors (chili, lime, and cilantro) with a little bit of sugar. The sauce glazes the chicken and is wonderful over the cilantro couscous. You can substitute salt and pepper to taste for MSG." Bring vegetable broth to a boil in a saucepan. Stir couscous into vegetable broth, turn off the heat, and let couscous stand until broth is absorbed, about 5 minutes. Stir cilantro into couscous. Arrange couscous onto a serving platter, top with chicken and sauce, and serve with lime wedges. 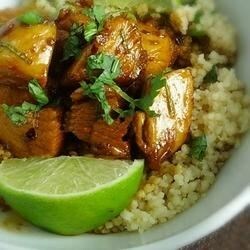 Squeeze lime wedges over couscous and chicken before serving. The lime was a bit too strong and it became way too salty as it reduced. Excellent! Next time I will add some fresh veggies.